According to the National Watermelon Promotion Board, the United States is the fifth largest producer of watermelons in the world, with the states of Georgia, Florida and Texas leading the nation. Watermelon is an even more important crop in the arid lands of China, Turkey and Iran, where salty ground water is prevalent. Watermelons prefer loose, well-drained, non-saline soils, but are able to tolerate some salt exposure during cultivation. Salt dissolves into water, separating into positively charged sodium (Na+) and negatively charged chlorine (Cl-) atoms. Sodium is close enough chemically to potassium to fool plant cells into absorbing it, thereby blocking potassium from where it is needed. Potassium plays a critical role in dozens of cell functions related to growth, mostly by causing enzyme structures to reorganize into their reactive forms. Growth and root development slow as a result of sodium poisoning. Watermelon is often grown in dry areas because, contrary to their name, melons don't require a lot of water in cultivation. In fact, too much water dilutes the sugars in the fruit, resulting in a less tasty product. However, where salt is present, crops become thirstier as osmosis pulls water out of their roots to balance with the salt. Worse, since dry areas can't count on rainwater to hydrate the fields, open irrigation often results in much of the irrigation water evaporating, and thereby concentrating salt before it gets to plant roots. Watermelon is also a very shallow-rooted plant; frequent watering is needed because fluid seeping into the soil soon descends beyond the useful reach of the plants. Water loss triggers a defense response in watermelon plants. Leaves close their stomata to reduce more water loss through transpiration. The plant produces osmolytes to stabilize cell membranes and stop water loss through osmosis. These measures are meant to be only temporary, as they also halt nutrient transport within the plant and carbon dioxide intake, which plants need for photosynthesis. Since sodium competes with potassium in plant cells, growers coping with saline soils fertilize heavily with potassium to make it more prevalent and therefore available to their crops. Evaporation of ground-sourced irrigation water increases its saline concentration, so preventing as much water loss as possible is important. Drip irrigation systems virtually bring evaporation to a halt, as the water is delivered directly to the base of the plants, where it can trickle straight down to the roots, shielded from the energy of the sun by the leaves of the plant. Watermelon absorbs some sodium and chloride atoms from saline solution, which end up in the fruit. Water also ends up in greater quantity in the fruit, with the result that the melons are juicier and have fewer solids than non-saline yields. 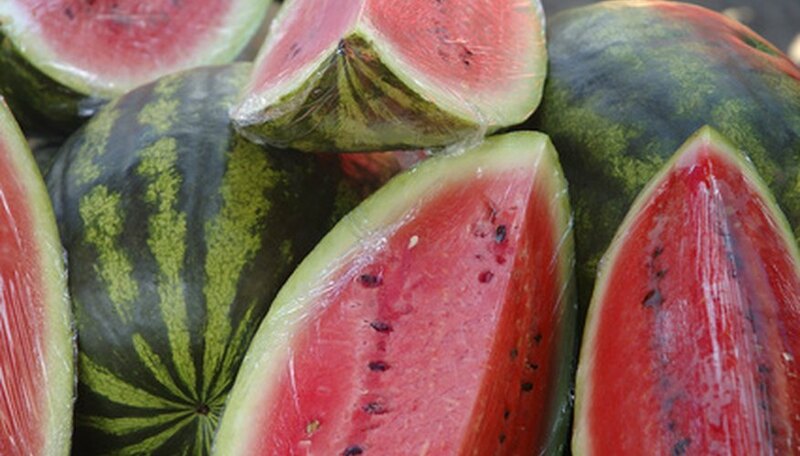 Through careful cultivation, research has shown that watermelon is moderately resilient and able to produce adequate yields up to a certain threshold of saline exposure, but if salt levels are too high, the harvest and plant vitality are adversely affected. The nutrient displacement, water loss and drop in photosynthesis all take their toll with stunted growth, yellowed leaves, little or no fruiting, and even plant mortality.